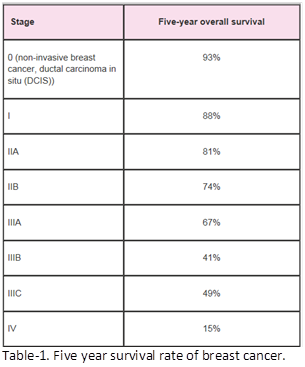 Statistics of breast cancer: Breast cancer is a type of cancer originating from breast tissue []. In 2009, breast cancer was the most common cancer in Australian women (excluding non-melanoma skin cancer), accounting for 27.4 per cent of all new cancers in women, with the average age of 60.7 years and with the risk of 1 in 8 women before 85 year old []. Interestingly, the incidence rate is dropped after 85 years old (Fig.1. []). This may be due to the interactions of wound and wound healing capacity inside the body []. 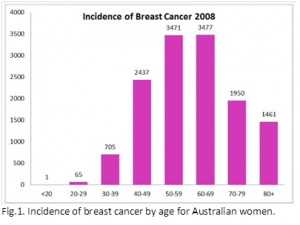 The incidence rate is increasing: in 2009, the number of new cases of breast cancer diagnosed in Australian women increased to 13,668, from 5,317 in 1982, and in 2020, this number is estimated to increase to 17,210. In 2010, breast cancer was the second leading cause of cancer-related death in Australian women, accounting for 15.3 per cent of all cancer deaths in Australian women, although the mortality rate decreased 30% since 1994. 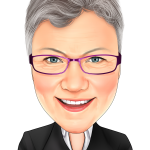 Between the periods 1982–1987 and 2006–2010, five-year relative survival increased from 72 per cent to 89.4 per cent in Australian women . These decreases are thought to be the result of treatment advances, earlier detection through screening, and increased awareness. About 15% of women who get breast cancer have a family member diagnosed with it. About 5-10% of breast cancers can be linked to gene mutations (abnormal changes) inherited from one’s mother or father. Mutations of the BRCA1 and BRCA2 genes are the most common. Women with these mutations have up to an 80% risk of developing breast cancer during their lifetime []. Classification. Since the high incidence of the breast cancer in the world, research on it is active and many types of breast cancer are classified for its treatments and prognosis. By histopathology. Breast cancer is usually classified primarily by its histological appearance. 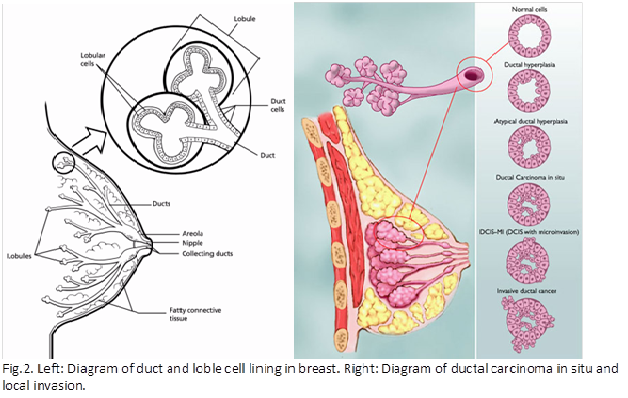 Most breast cancers are derived from the epithelium lining the ducts or lobules (Fig.2, [],[]), and these cancers are classified as ductal or lobular carcinoma. Carcinoma in situ is the growth of cancer cells within a particular tissue compartment such as the mammary duct without invasion of the surrounding tissue. In contrast, invasive carcinoma does not confine itself to the initial tissue compartment . If the cancer is ductal carcinoma in situ or has not spread to the lymph nodes, the 5-year survival rates with treatment are up to 98%. If the cancer has spread to the lymph nodes, the 5-year survival rate is about 84%. If the cancer has spread (metastasized) to other sites (most often the lung, liver, and bone), the average 5-year survival rate is 27% []. By grade. 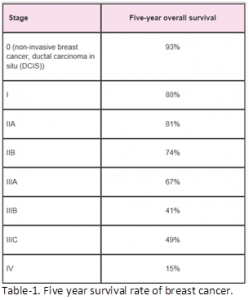 In pathology, grading compares the appearance of the breast cancer cells to the appearance of normal breast tissue. Normal cells in breast line up in an orderly way to make up the milk. Cancerous cells lose that differentiation. Their nuclei become less uniform, their divisions become faster, their shapes become irregular and they grow in all directions without confinement. Pathologists describe cells as well differentiated (low grade), moderately differentiated (intermediate grade), and poorly differentiated (high grade) as the cells progressively lose the features seen in normal breast cells. Poorly differentiated cancers (the ones whose tissue is least like normal breast tissue) have a worse prognosis . By stage. Breast cancer staging using the TNM system is based on the size of the tumor (T), whether or not the tumor has spread to the lymph nodes (N) in the armpits, and whether the tumor has metastasized (M) (i.e. spread to a more distant part of the body). Larger size, nodal spread, and metastasis have a larger stage number and a worse prognosis. Stage 4 is 'metastatic' cancer that has a less favorable prognosis . The difference between the two classifications of grade and stage is that the former views the status from pathology and the latter views it from the cancer cell migration. By receptor status. Breast cancer cells may or may not have three important receptors: estrogen receptor (ER), progesterone receptor (PR), and human epidermal growth factor receptor 2 (HER2). Cancer cells with some or all positive receptors may respond to some drugs and generally have a better prognosis. Cells with none of these receptors are called triple-negative . The risk of relapse after treatment on those triple-negative is much higher for the first 3–5 years but drops sharply and substantially below that of hormone-positive breast cancers after that . By genetics. Many gene mutations (For some reason, the normal nucleotide sequence is changed in DNA) account for the risk of breast cancer, including BRCA1/2, p53, PTEN, STK11, CHEK1, ATM, BRIP1 and PALB2 . 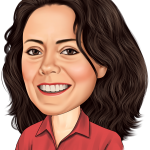 A woman who has a mutation in BRCA1 or BRCA2 is about five times more likely to develop breast cancer than a woman who does not have such a mutation. However, since family members share a proportion of their genes and, often, their environment, it is possible that the large number of cancer cases seen in these families may be due in part to other genetic or environmental factors. Therefore, risk estimates that are based on families with many affected members may not accurately reflect the levels of risk for BRCA1 and BRCA2 mutation carriers in the general population []. Metastasis. When the cancer cells migrate from the place where they first started to another place in the body, it is called metastasis (Fig.3, []). Breast cancer primarily metastasizes distantly to the bone, lungs, liver and brain, with the most common site being the bone. Lymph node metastasis into the sentinel node and few surrounding nodes is regarded as a treatable local event. The prognosis is often poor. Distant metastases are the cause of about 90% of deaths of breast cancer []. Sometimes the metastasis may be found first but the primary tumor cannot be found, despite extensive tests. As the techniques are constantly improving, the number of cases of this unknown primary origin is going down. Bilateral breast cancer has an overall incidence of 4–20% in patients with primary operable breast cancer []. The tumors of the two sides can be from the same clone (one metastasized from the other) or two different clones of tumor cells (two primaries). Metastasis occurs more likely than two primary tumors, especially in those synchronous bilateral breast cancers (two sides of breast cancer found at the same time) []. Gender: Simply being a woman is the main risk factor for developing breast cancer. Age: Nearly half (48%) of female breast cancer cases is diagnosed in the 50-69 age group []. Genetic risk factors: The most common cause of hereditary breast cancer is an inherited mutation in the BRCA1 and BRCA2 genes. Other gene mutations can also lead to inherited breast cancers, including ATM, TP53, CHEK2, PTEN, CDH1, STK11, etc. Family history of breast cancer: Having one first-degree relative (mother, sister, or daughter) with breast cancer approximately doubles a woman's risk. This could be from the similar lifestyles and similar genetic responses to the risk factors. 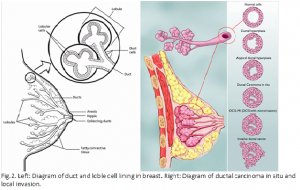 Dense breast tissue: Women with dense breasts (more more glandular and fibrous tissue and less fatty tissue) may have a higher risk of breast cancer than women with less dense breasts. Menstrual periods: Women who have had more menstrual cycles have a slightly higher risk of breast cancer. Having children: Women who have had no children or who had their first child after age 30 have a slightly higher breast cancer risk. Breastfeeding: Breastfeeding may slightly lower breast cancer risk. Alcohol and smoke: The use of alcohol and tobacco smoke is linked to an increased risk of developing breast cancer. The risk increases with the amount consumed. Obese and exercise: Obese is a risk factor of breast cancer. Appropriate exercise lowers the risk. Diet: About 50% of cancer incidences and 35% of cancer mortality in the U.S., represented by cancers of the breast, prostate, pancreas, ovary, endometrium, and colon, are reported to be associated with Western dietary habits []. Due to the difficulties of study with a limitation on a certain food for a long time, the results may show an inconsistency. If there is a link, a diet high in fat, high in red meat and processed meat, and low in fruits and vegetables might lead to health problems, including to the risk of breast cancer. Chemicals in the environment: Pesticides on vegetables and fruits, preservatives in foods, some chemicals in drinking water, breathing air, plastics, certain cosmetics and personal care products may increase risk of cancer in animal tests. These could in theory affect breast cancer risk. Unfortunately, studying such effects in humans is difficult. Stress: Although the difficulty of measuring stress makes it difficult to demonstrate a tangible relationship between stress and breast cancer, studies reveal that stress is related to breast cancer in various ways []. Chinese herbs on breast cancer. The current standard therapies for breast cancer are surgery, chemotherapy and radiation therapy. The 5-year survival rate refers to the percentage of patients who live at least 5 years after their cancer is found. Table-1 shows the overall 5-year survival rates under the current technology. The early discovery of the breast cancer is very important for its prognosis. The standard therapies are the most effective methods to remove and inactivate the breast cancer mass. They earn the time for body’s natural healing power to adjust the imbalanced metabolisms back to normal. However, to prevent the recurrence and metastasis after the standard therapies, the cancer survivor must limit the above risk factors as much as possible to avoid the imbalanced metabolisms. In this situation, Traditional Chinese Medicine (TCM), can play very important roles in breast cancer treatments, including relief of side effects and complications from standard therapies, increasing the quality of life and especially the prevention of recurrence and metastasis (Table-2), since TCM can adjust the formulas according to the TCM indications, leading the metabolisms to the homeostasis. A normal metabolism is the guarantee of free cancer status inside the body. 3. Chong-Ren imbalance syndrome (Er Xian Tang []). 4. Deficiency of the vital principle and poison blazing (Ba Zhen Tang []). 3. Qi deficiency and blood stasis (Yi Qi Huo Xue Tang []). 3. Yin deficiency and fire-toxicity syndrome. 3. Chong-Ren imbalance syndrome (Er Xian Tang ). Table-2. TCM indications of breast cancer and Chinese herbs for them. X. Meng et al: A new hypothesis for cancer mechanism. 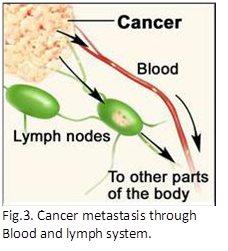 Cancer and metastasis reviews. 2012 June; 31(1-2): 247–268. Dawson LA et al: Evolving perspectives in contralateral breast cancer. Eur J Cancer 1998;34:2000-9. Soo Jung Gong et al: Bilateral Breast Cancer: Differential Diagnosis Using Histological and Biological Parameters. Jpn J Clin Oncol. 2007 Jul;37(7):487-92. Epub 2007 Aug 1. G Williams et al: Diet and cancer prevention: the fiber first diet. Toxicol. Sci., Dec 1999; 52: 72 – 86.